Let’s face it: This is England, and no season can ever truly rid us of rain. With a bit of luck, though, the spring months will bring enough warmth to tempt us off the sofa, umbrella in hand, in search of fresh air and excitement. To help guide you along, we’ve compiled a list of activities that will have you covered in paint, scoffing salt beef, cheering on goats, and exploring secret gardens, all before summer kicks in. It turns out Londoners love getting messy, and the Indian festival of Holi provides a great excuse; throwing colored paint is a tradition that’s fun no matter your heritage. This annual pop-up allows you to hurl a rainbow at your pals, and -- thankfully -- overalls are provided. The Wellcome Collection has a strong track record when it comes to thought provoking (but accessible) science-related exhibitions -- and best of all, they’re always free. This year, you’ll learn the story of electricity and humans’ relationship with it via an engaging collection of artifacts and artworks at Electricity: The Spark of Life. Most Saturdays bring a free musical performance to the stunning surrounds of the Union Chapel, but this is a special one. Celebrating 10 years of Daylight Music (which organises the free gigs), this afternoon will offer a magical array of storytelling, performances, and tunes. It’s London’s own answer to Katz’s Delicatessen, and it’s finally setting up shop for good. After years making a meaty name for itself at Maltby Street Market, Monty’s Deli will be selling its pastrami, salt beef, and top-notch Reuben sandwiches every day of the week in Hoxton starting this April. The portions aren’t as big as those in New York, but then again neither are its prices. Tove Jansson’s cute, puffy troll creations are taking over London’s most famous botanical gardens for the Easter holidays, which is a great excuse to go and explore. The trails and games are aimed at younger visitors, but given that the Scandi creatures are totally having a moment this year, we predict many a 20-something will also be spotted among the foliage. Every spring, the universities of Oxford and Cambridge race each other down the Thames. Pretty exciting stuff, but you know what's more fun even than boats? Goats, that’s what. This wonderfully silly, family-friendly day-out sees two (sometimes even three) of Spitalfields City Farm's pygmy goats dash along a cobbled pathway to the finish (and their feed bucket). Proceeds all go towards the upkeep of the farm. If you wouldn't be caught dead in a Starbucks and think instant coffee tastes worse than the soil it resembles, the London Coffee Festival is your Shangri-La. Taste new varieties until you have the jitters, then try to concentrate on the incredible latte art, brewing demonstrations, and barista races. Ironically, Monopoly no longer has the monopoly on board games. This weekend festival celebrates the beat in modern gaming, and besides the modern board game, that means VR, escape games, puzzle solving, and mad new takes on the traditional stuff. Play on, player. 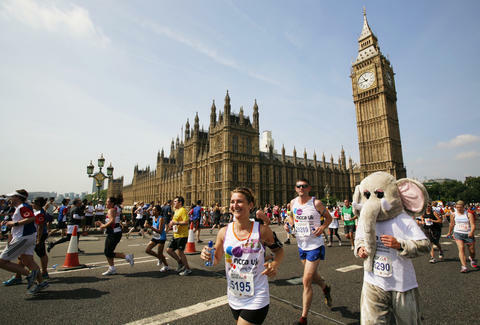 Even if you can hardly run for a bus, the London Marathon is a surprisingly good watch. Something about yelling enthusiastically at sweaty strangers is weirdly heartwarming, and lots of the runners wear fancy dress that’s far from practical (but very entertaining). But if you think you might run it next year don't watch from the end of the route -- those guys look knackered. New York has led the way in the new musical realm lately (ahem, Hamilton), so it’s great to have something sparkier than Andrew Lloyd Webber to show for ourselves in the West End. This honest, sparky show about a Scottish convent school’s trouble-making choir girls looks set to knock everyone’s knee-high socks off. Opening May 9 with no set close date. If this exhibition floats your boat (or indeed your giant inflatable pig) then snap up tickets sharpish, because the V&A has been putting on some very high profile and very popular exhibitions over the last few years. From May 13 on, learn more about Pink Floyd’s music, design, and stage shows, and look right into a mask of Roger Waters’ face from 1979’s The Wall Live. There’s an ace indie/dance music festival called Green Man that’s held in Wales every August, and the people who run it are kindly bringing this warmup weekend to King’s Cross for a second time. The combination of excellent music and hundreds of barrels full of Welsh beer and cider makes for a very fun outing -- at last year’s event, we learned that one human cannot try 100 different beers in one weekend. Sad but true. Offering one of London’s few good alternative line-ups (as in, not an Ed Sheeran to be found), this hipster’s paradise is perennially popular and always full of party people in short shorts and ironic Hawaiian shirts. Pray for sunshine, though... nobody in London owns wellies. The most wholesome must-see on the list, this free festival allows you to poke around the city’s green spaces, secret-garden style. Allotments, kitchen gardens, pocket parks, and even the sweeping lawns of stately homes are on this extensive list, and many offer free tours as well. Ashleigh Arnott is a London-based writer who gets out way too much. Follow @ashleigharnott on Twitter and Instagram for banality and food, respectively.